Braemar Castle is undergoing an ambitious £1,000,000 programme of repair and conservation. To date, the community have raised £400,000. The roof and chimneys have been repaired using traditional techniques and by preserving the 18th century roof slates. Work on the castle will continue until the building is fully conserved. The project also aims to build a visitor centre with educational and exhibition facilities. Braemar is the only community run castle in Scotland and the people of the village believe passionately that the Castle is worth preserving for a wider audience to enjoy. We offer you the satisfaction of knowing that you are contributing to this aspiration and supporting a heritage of immeasurable value. The castle does not receive regular funding and relies on fundraising for restoration. Your Friends Membership will help to ensure the survival of the castle and secure it for the future. Membership starts from £16 a year. 10% off in the gift shop. A six monthly newsletter to keep you up to date. Free entry to Braemar Castle all season. Advance notice of events and exhibitions. 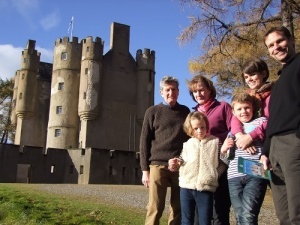 Gift Aid is an easy way increase the value of your gift of money to Braemar Castle. Gift Aid does not cost any more but allows us to claim UK Income Tax you have paid on the amount. In order to be eligible for Gift Aid, you must pay an amount of Income Tax or Capital Gains Tax equal to the tax the friends can claim on your donation. The Castle will claim basic rate Income Tax unless notified otherwise. If you wish to participate please complete the following. I wish the Friends of Braemar Castle to treat all donations I make from the date of this declaration until I notify otherwise as Gift Aid donations. On clicking submit you will be taken to our PayPal site.